The Vancouver Canucks struggled defensively in the 2016-17 season, fishing the puck out of their net 241 times, the fifth highest total in the League. Riddled with injuries and inexperience, the Canucks’ blue line was a shell of its potential. With the status of injured Erik Gudbranson still unknown, the departure of Luca Sbisa and with the loss of Nikita Tryamkin to the KHL, Canucks management acquired Michael Del Zotto and Patrick Wiercioch to add some stability to the lineup. The Canucks’ defence seems to be in a solid place, equipped with up-and-coming potential and a veteran backing to steer the young talent in the right direction. On the back end, the Canucks have three young guns glowing with potential. In the next handful of seasons, I’d expect two, if not all three, to stride into a solidified top-four role on the blue line. First up is Troy Stecher, a Richmond, British Columbia product living out a childhood dream and playing for his hometown Canucks. Standing at only 5’10”, Stecher is on the smaller side of things but makes up for it with his great skating and offensive play. The 23-year-old led the Canucks defense with 24 points 71 games and put himself on the map as a future weapon from the point. In the 2017-18 season, Stecher will likely be paired with veteran Michael Del Zotto so that he can further develop as the Canucks dive into a rebuild. The next defender to watch as he develops is Ben Hutton, a smooth-skating, two-way defenceman that runs a simple breakout and often jumps into the rush with his speed. Formerly a forward, Hutton uses his IQ to not only effectively jump into the rush but to also shut down opposing forwards. Last season, Hutton finished third in the team’s defensive scoring with 19 points in 71 games. He showed signs of what’s to come which has the Canucks faithful and management very excited for the future. Hutton can be expected to carry a top-four role next season and see a considerable amount of power play time. 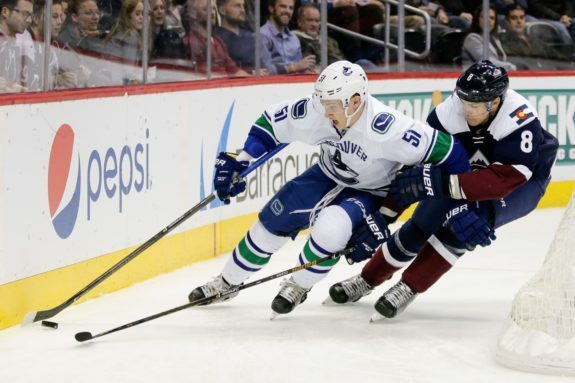 I wouldn’t expect to see too much of Olli Juolevi in the 2017-18 season but, in the next handful of seasons, he will undoubtedly become a focal point on the Canucks’ defensive roster. Out of Helsinki, Finland, Juolevi is a very smooth defender with a high hockey IQ and a knack for finding the score sheet. During the 2015-16 season with the London Knights of the OHL, he pitched in 42 points in 57 games on the way to hoisting the Memorial Cup. Last season, he matched his 2015-16 point total while sitting on a cushy +26 rating in 58 games. 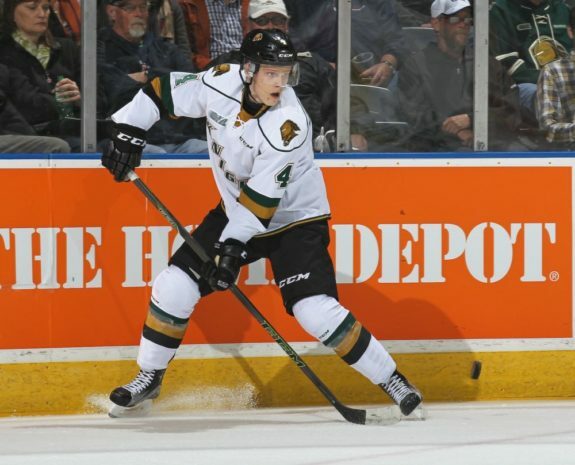 Shining with talent, Juolevi will be on the Canucks’ top pair soon. Veterans are equally as important to an organization as prospects because they add stability and guidance for young players as they develop early in their careers, and the Canucks have no shortage of veterans. Chris Tanev is captain reliable and praised for his ability to make safe plays, whether he’s making a simple pass up ice or alleviating pressure with a soft flip of the puck to center. The 27-year-old is a seven-season veteran and logs big minutes against opposing stars. He has reached the 20-point mark only once in his career but can certainly demonstrate a simplistic defensive style that the young guns can mimic and add to their growing arsenal. Standing at 6’3″ and 214 lbs is the big Swede. An 11-season veteran, Edler has been a fixture on the Canucks’ blue line for quite some time. 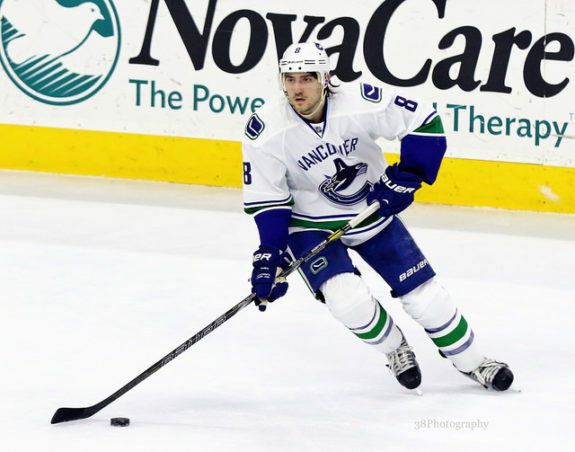 He is a two-way defender good for 20-to-30 points per season and the number one defenceman for the Canucks. He isn’t flashy but he logs big minutes and is versatile, playing in all situations ranging from shutdown minutes to power play time. On and off the ice, Edler is a leader and young players can learn a lot from the veteran — primarily leadership qualities and a well-rounded game. Despite being a newcomer, Del Zotto will be a role model to players such as Hutton and Stetcher as they play similar styles. Del Zotto has played in eight NHL seasons for three different teams (Rangers, Flyers, Predators) and grown tremendously as a player. 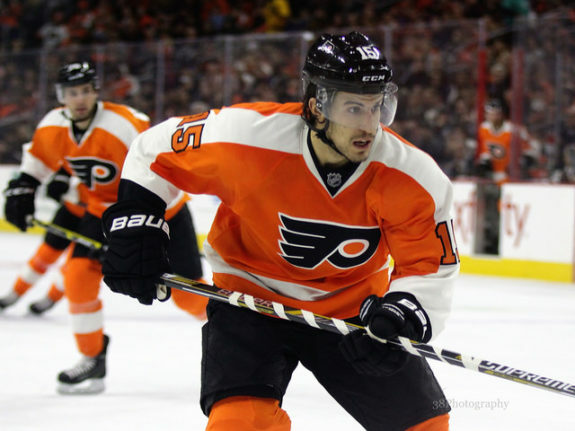 When he joined the League, Del Zotto was a strictly offensive defenceman. His ability to adapt and convert into a solid two-way defender is why he has developed into a valuable asset. When playing a full season, Del Zotto is capable of notching 30 to 40 points and will help craft Stecher and/or Hutton’s offensive game. If nothing else, he can show the importance of adaptability and versatility in today’s ever-changing game of hockey.